So I went to The Cuff and had a Top Shelf Electric Ice Tea and I still didn't contract gay, as far as I can tell. I'm beginning to think that it doesn't spread quite as easily as Rev. Pat Robertson has led me to believe. 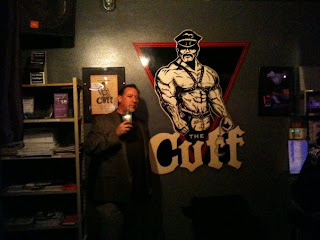 Anyway, I had an entirely inaccurate impression of The Cuff: I was thinking it was a relatively small, leather bar, and of course it's a large, varied, multilevel place (I guess that's why they call it the "Cuff Complex"). And I have it on good authority that the next time I get a Top Shelf Electric Ice Tea it should be from the back patio.